Markings: Blindstamp of Le Gray. Other Markings: Blindstamp of MacGill, 7 Hanover St., Edinburgh. 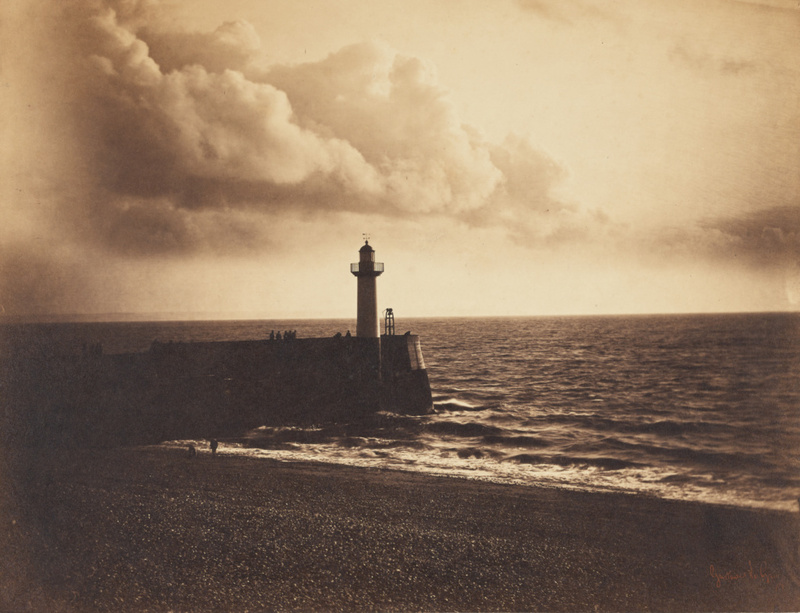 Positioning his camera so that the Le Havre lighthouse was precisely in the middle of his field of vision, Gustave Le Grey made this dramatic photograph along France's northwest coast. This composition is far more geometric than many of Le Gray's seascapes. The lighthouse and jetty divides the picture vertically into two nearly equal halves, just as the line of the sea and sky splits it horizontally. The waves lapping onto the pebble beach and the billowing clouds, both of which advance to the right, infuse this brooding image with a dynamic sense of movement. Hellman, Karen, ed. Real/Ideal: Photography in Mid-Nineteenth-Century France, exh. cat. (Los Angeles: J. Paul Getty Museum, 2016), pl. 115.